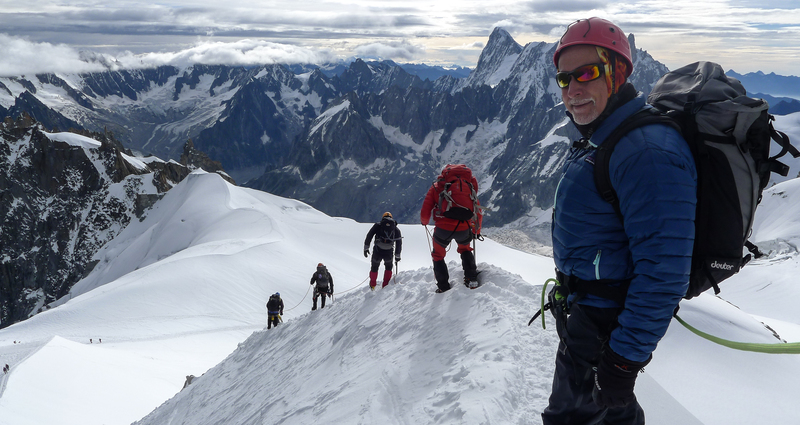 My second Alpine trip this summer was a short but intense day near the Aiguille du Midi in the Mont Blanc region. The cable car from Chamonix remains the highest vertical ascent cable car in the world, from 1,035 m to 3842 m, an altitude gain of over 2,800 m in 20 minutes. The Aiguille du Midi is the starting point for the ski trip down the Vallée Blanche which I did some years ago, 17 km and over 2,000 m descent. 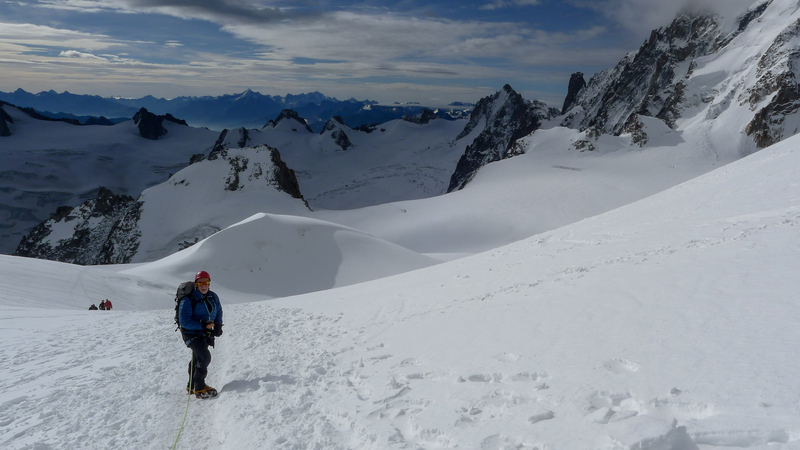 It is also the starting point for various climbs nearby and for access to the Cosmiques Hut, at the beginning of the Three Mont Blancs route to the summit of Mont Blanc. Exiting the top cable car station to descend the snow ridge leading off Aiguille du Midi. Over the last few years, I’ve done a number of alpine climbs with Yannick Flugi, a guide living in Geneva (http://www.atyview.com/). 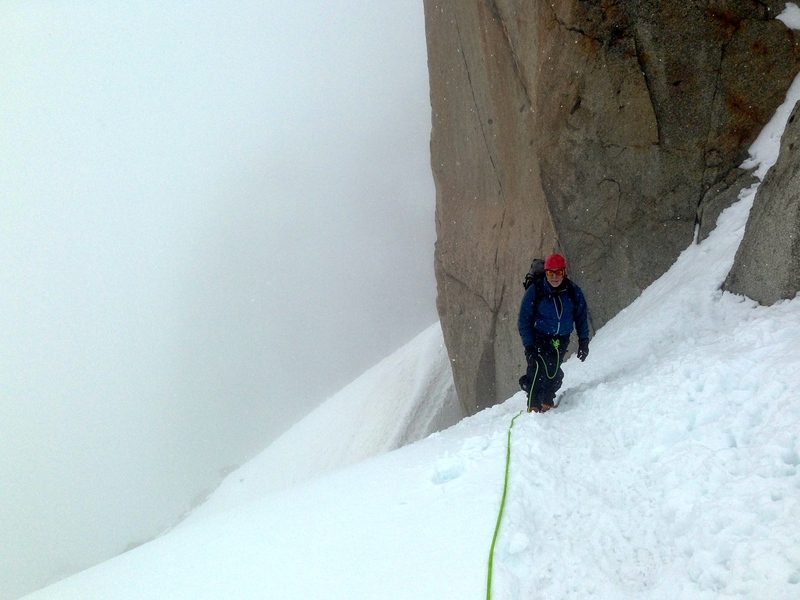 I hadn’t done a trip the previous year, and starting the trip by stepping out onto this narrow and steep ridge in crampons was quite daunting initially. 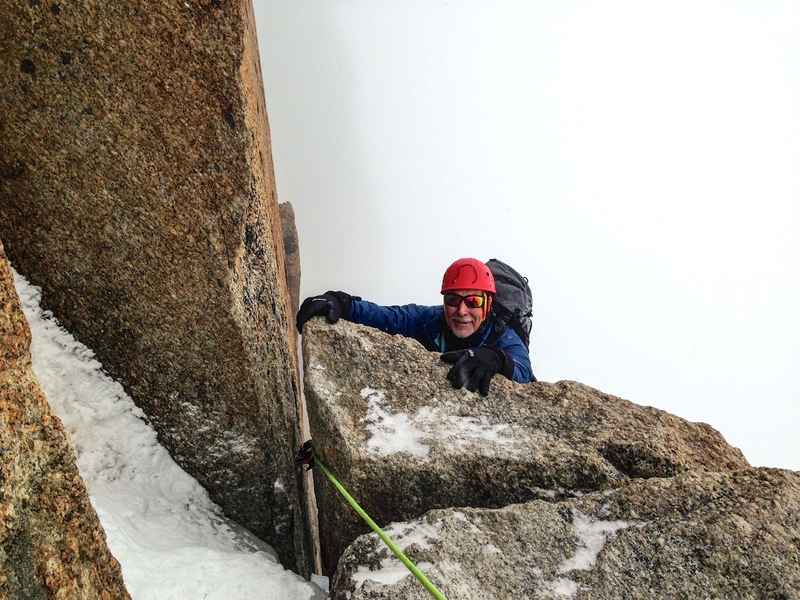 Its all about moving confidently standing on the crampons, not relying on the ice axe or crouching at all. The left side of the ridge drops almost 2000 m to Chamonix, the other side has quite some exposure also. Yannick did not tell me till later that day that, a week or two earlier, a guide and two clients had fallen from this ridge to their death (left side). It seems the guide had tripped on a bit of ice and pulled the two others with him. Once down off the snow ridge there was about half an hour downhill towards Cosmiques Hut and the start of the ridge that runs back up to the Aiguille. I had not looked at any route descriptions or internet material so was rather naively believing Yannick’s claim that it was not too challenging for me. But just as well, would probably never have attempted it if I had known more. Heading south towards Cosmiques Hut and the beginning of the climb. The summit of Gran Paradiso could be seen on the horizon, it is hidden behind the ridge on the right in this photo. Looking up from the base of the ridge. A couple of climbers are visible right on the skyline. As we got higher up on the ridge, the clouds came in and visibility got lower, though from time to time we got glimpses through gaps in the clouds that let me realize just how exposed some of the route is. 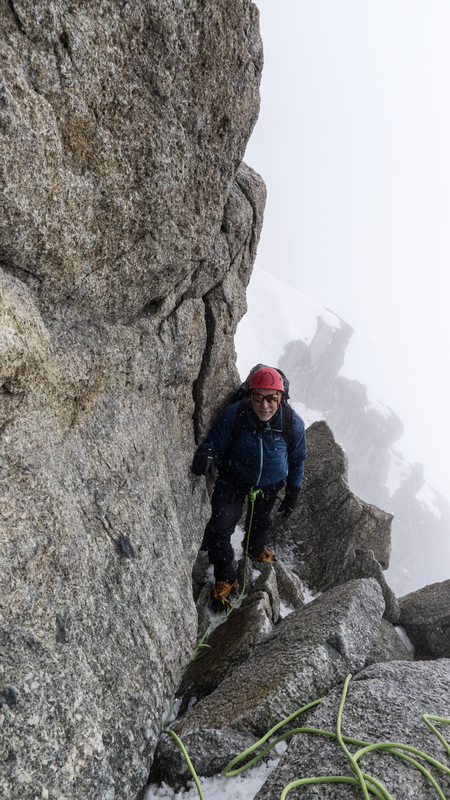 After the first real pitch, not too long, I said to Yannick that I doubted I could cope with more rock at that level of difficulty and he said not to worry that was the worst. Well, he wasn’t quite telling the truth. The crux of the climb was ahead. The crux is graded 4a (about Ewbank grade 12) which is about the same level I was climbing when I hung out with the mountaineers at Sydney University many years ago. But it’s a little different when you are climbing at close to 4000m altitude in crampons, and with some breathtaking exposure. The visibility was patchy and I avoided looking down while climbing up, but it was obvious enough at times that there were hundreds of metres below my feet. Two climbers ahead of us on the crux pitch. Crampons biting into rock are visible through the crack as I get close to the top of the crux. Again, Yannick assured me the worst was over. 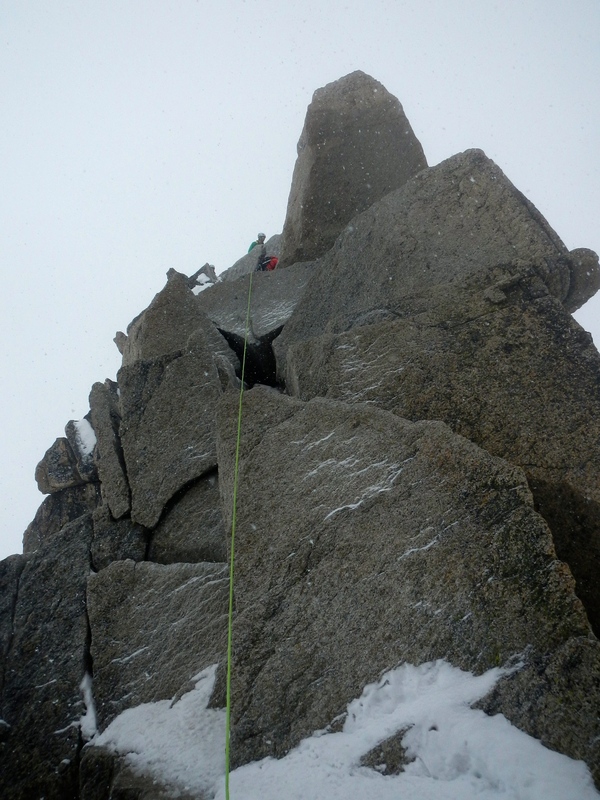 In fact, I had more difficulty on the following pitch which involved jamming my body into a quite wide crack. Difficult probably because I didn’t quite get it right and managed to jam my backpack in the crack limiting my movement. Didn’t help that there seemed to be a lot of exposure below me. But I made it, and in retrospect, Yannick was quite right. The climbs were within my capability, and I stretched myself and found I could do things I would not have thought I could. 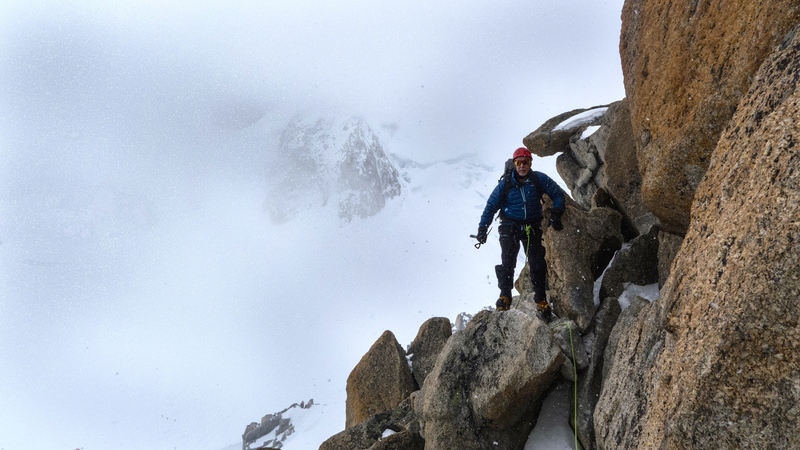 Climbing in crampons is certainly different to the rock climbing I’ve done in the past, and I’d need to do more to develop confidence and skill. Maybe…. 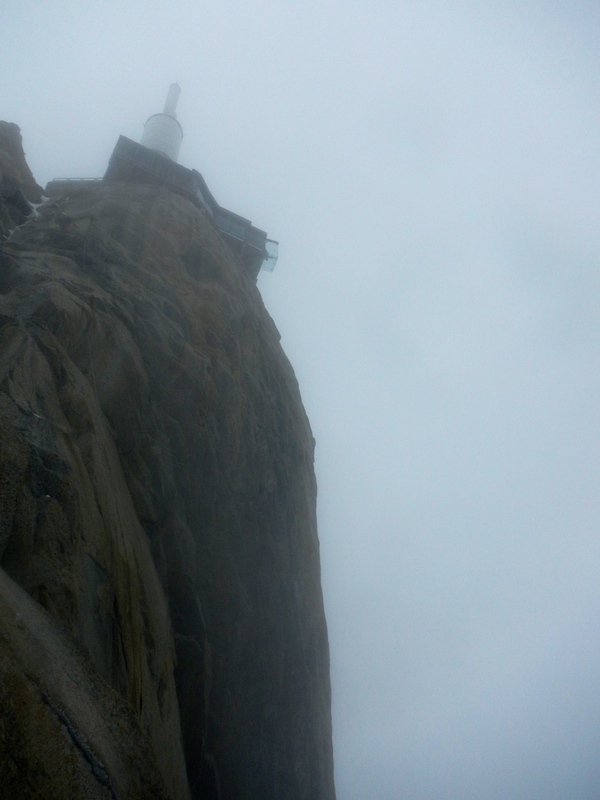 The visibility got worse as we approached to top of the ridge and saw the Aiguille du Midi viewing platform and tower looming above us. Probably just as well, so I could focus on the rock, not the air below. 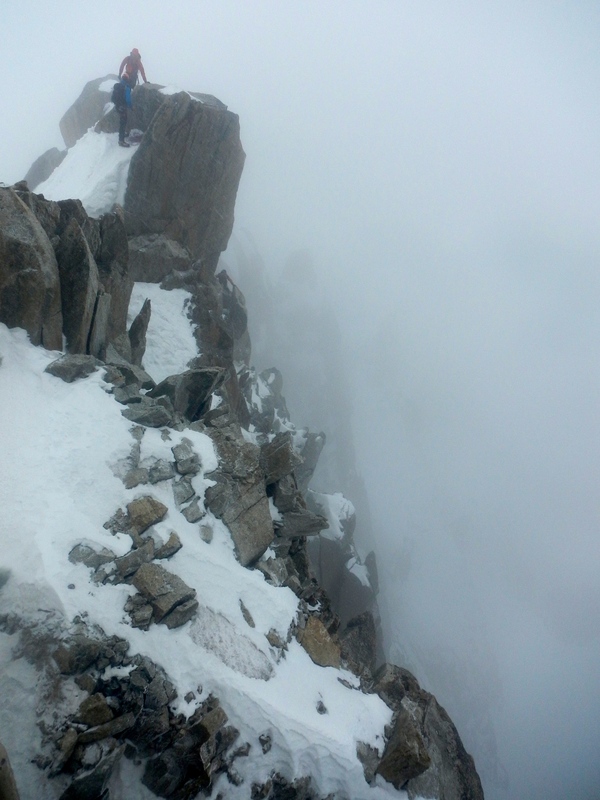 The final pitches leading to the viewing platform are just behind the rocky spine in the middle of the photo below, leading up to the final gendarme, which two climbers are traversing to get to the viewing platform that I’ve already reached, when I took this photo. 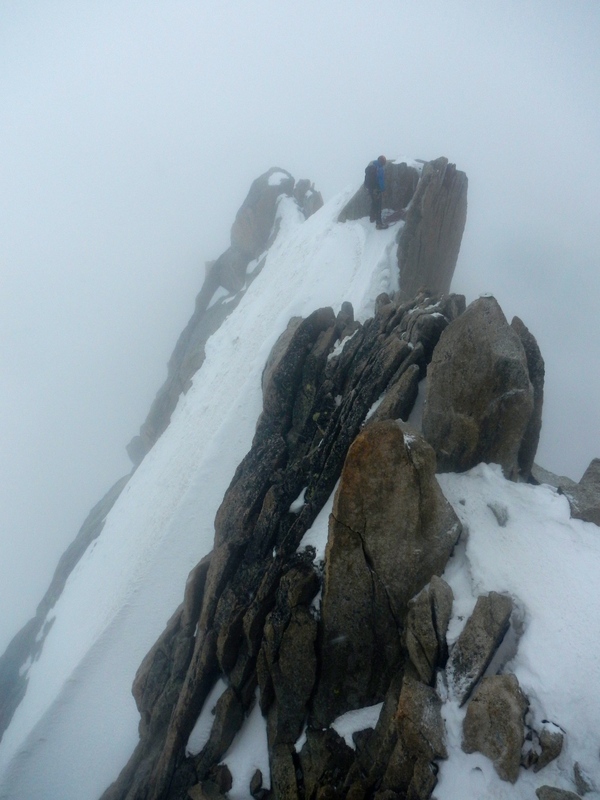 Yannick crossing the summit of the final gendarme, heading for the viewing platform that is the exit from the climb. 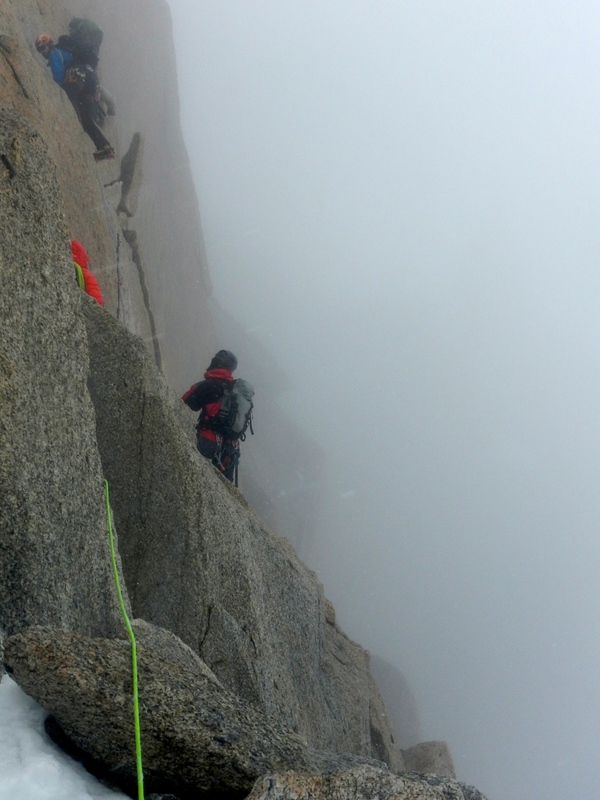 Another view of the traverse of the final gendarme. The viewing platform is reached via a metal ladder. 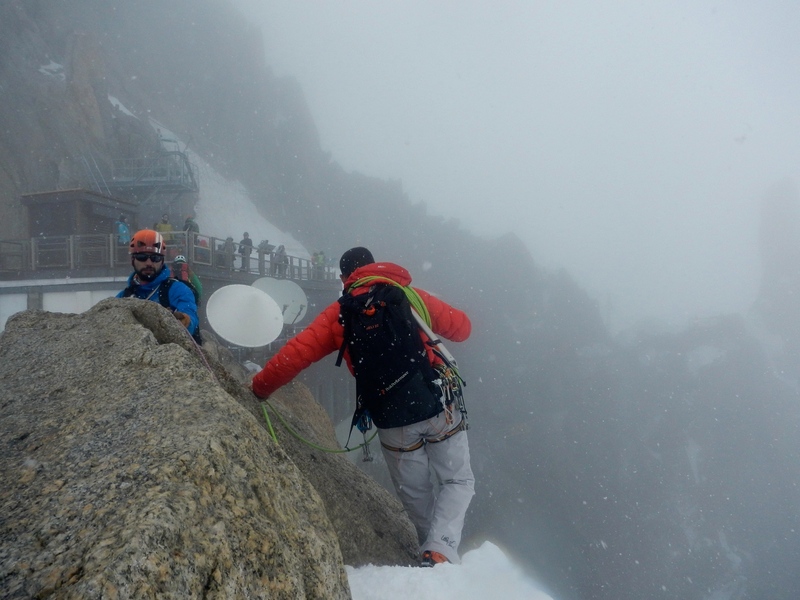 We feel like heroes as we scramble over the rail with crampons, iceaxe, harness etc to the awed gazes of the tourists. 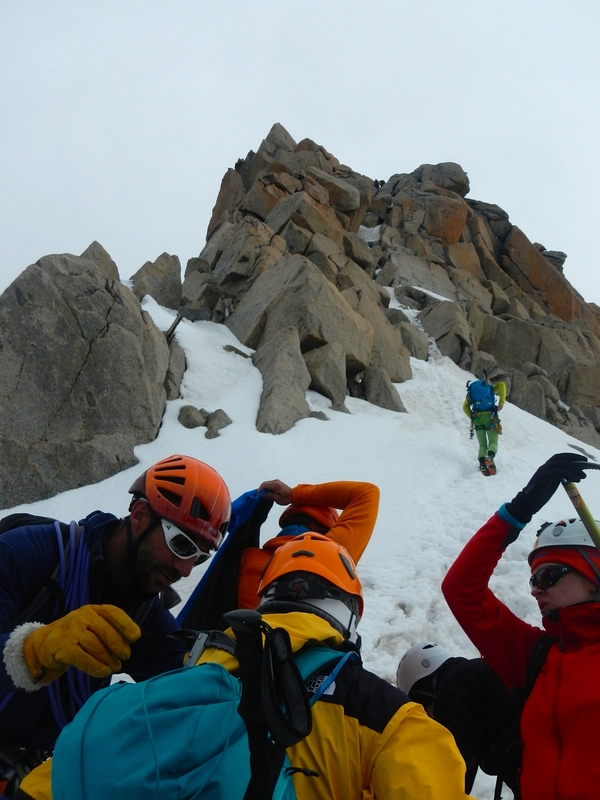 We completed the Arête in very good time, partly because we were ahead of a somewhat larger party and did not want them to overtake us, partly because the weather was deteriorating and it was snowing lightly for the last part of the climb, so we didn’t want to delay. 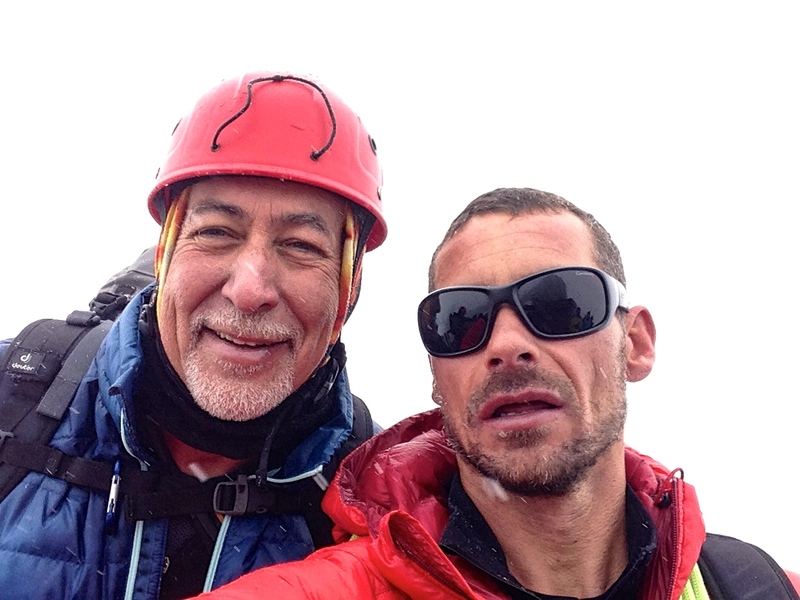 All in all, an extraordinary trip, and pushed me to climb stuff more difficult than I have done for over three decades. And feeling pretty good about it after its over, as you see from the grin on my face. Yannick and I on the viewing platform after a successful ascent. This entry was posted in Mountains, Photography and tagged Aiguille du Midi, Alps, climbing, France, mountaineering by colinmathers. Bookmark the permalink.